[tps_footer]Deepika Padukone and Katrina Kaif are not only in limelight for their neck to neck competition. The two highly talented divas are always attracting attention for their personal lives too. The cat fight between Deepika and Katrina is already age old. The two starlets Deepika and Katrina have now and then gained headlines for their indirect sarcasms towards each other. Yet again the loggerheads are on a war of words. It was being said that Katrina Kaif is not too pleased with the close bond of Deepika and Ranbir. The Tamasha stars Deepika Padukone and Ranbir Kapoor gained all the eyeballs when they confessed amazing things about each other during the promotions of the film. The two were also applauded for their unique chemistry in the film ‘Tamasha’. The said instances apparently created a crack between Ranbir and Katrina’s relationship too. Fitoor actress Katrina was asked about Ranbir and Deepika working together in the film ‘Tamasha’, the actress was evidently not too pleased about the same and confessed indirectly saying she cannot force her will on others. The actress added that the choices are an individual’s own even if she is not happy about it. Displaying a huge amount of disappointment Katrina further said that she believes that as people mature they will change their choices. 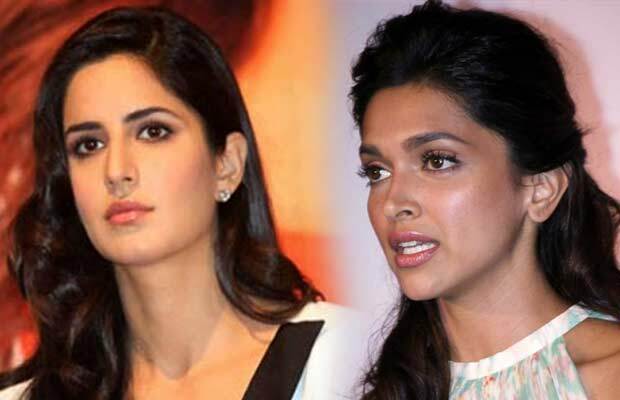 Deepika Padukone ’s fitting reply to Katrina Kaif is surely not going to be unheard. The beautiful starlet Deepika on the career front has recently signed her first Hollywood project with Vin Diesel, whereas Katrina Kaif will soon be seen in Abhishek Kapoor’s ‘Fitoor’. Now when does this war end only time will tell. Next articleComplete Winners List Of 61st Britannia Filmfare Awards!